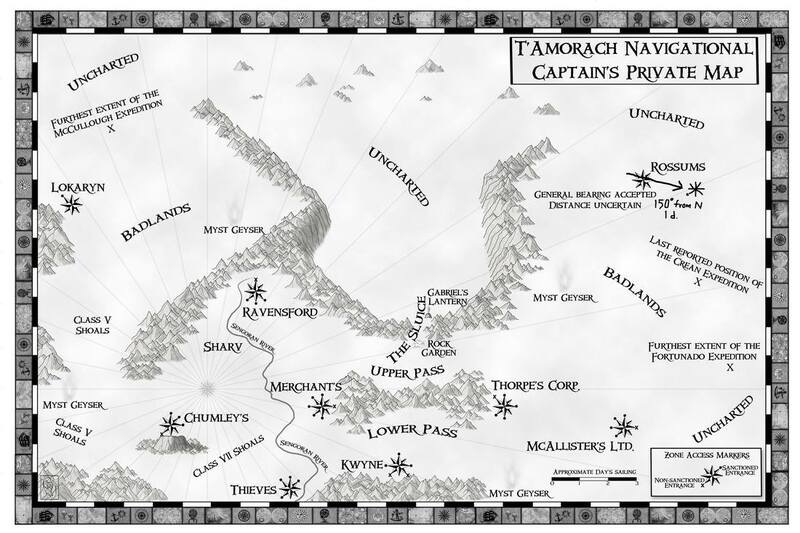 T'Amorach was a once thriving world until the Cataclysm an event of unknown origin, rendered it largely inhabitable. Now hundreds of years later, disparate cultures survive, separated and protected within large domed "zones." Though there is not a true peace, there is survival. Each has something that the others need. Trade flourishes and a fragile balance endures. Separating the zones is the badlands, an area inhabited by nothing friendly and frequently covered by a caustic, flowing mysts. It is upon these low lying clouds that the great myst-clipper ships of T'Amorach travel and grow rich by facilitating trade. Some, however, are involved in a more dangerous endeavor: the liberation of sentient machines through an underground railroad. Most famous within this secret network was the Shicaine, a ship of legend, until it disappeared. Betrayed on a mission, her crew were captured and scattered to the zones never to meet again. Now five years later, former crew members are starting to turn up dead and it's up to Captain Nathaniel Gedrick to find them and find out why as someone bringing the zones to the brink of war.